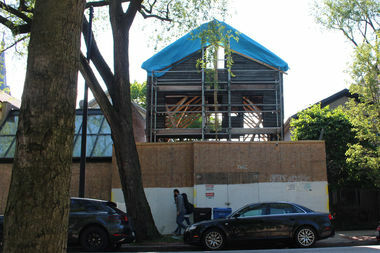 The house at 1720 N. Sedgwick St. has been stabilized, but as little more than a skeleton frame. DOWNTOWN — The owner of a "rotted" house in the Old Town Triangle Historic District was given 45 days to come up with a final repair plan following a court hearing Thursday at the Daley Center. Hugh Howard, attorney for Joseph Younes, owner of a house at 1720 N. Sedgwick St. left exposed to the elements earlier this year, sought 45 days for a structural engineer to examine fresh soil tests and other aspects of a new basement foundation to come up with a final repair plan. "The city hopes that before winter there's significant progress," said city attorney Greg Janes. He agreed to the delay setting the next court date for Oct. 19 before Associate Judge Patrice Ball-Reed. "We are satisfied with the progress at this point," Ald. Michele Smith (43rd) said in court. Smith charged in March that Younes and his contractor deliberately tore the roof off the building and left its interior exposed to the elements to cause it to rot so they could demolish it and start fresh on the lot. Facing stiff fines for violating landmark regulations in the Old Town Triangle Historic District and other city building ordinances, Younes has responded that the building "rotted" with age and that he intends to restore it as it was. After Thursday's hearing, Smith said the process was "moving way too slow," but that at least it's moving forward. She said she expected potential fines to be addressed once a final repair plan is approved and the cost estimated. "Step by step," she said, "we expect compliance."